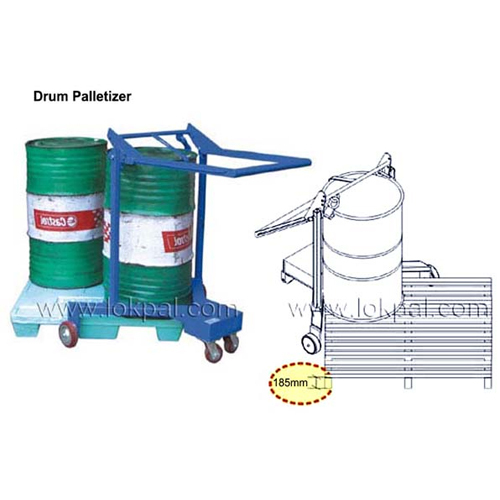 Drum Palletizer is very useful for palletizing of standard 210 ltrs MS drums with minimum of effort and time. Suitable for maximum pallet height of 185 mm can also be used to transport drums. Extremely useful for transportation and palletization of drums. It helps to place standard steel drum on to pallet. Stack 2 to 4 similar drum on pallet. The whole Pallet with drum can be moved from one place to other. Drum Palletizers uses high strength lifting components. Specially contoured teeth at column and specially designed side locks at top, provides safety features for reliability and ease of use. Spring loaded handle locks with knurled handle grippers provide operator, ease in locking the handle at any desired position with safety and reliability. Drum Clamps is very easy to operate. Fully Powered Coated body. Extremely useful for loading and handling drums. Drum Clamps specially designed clamping attachments for handling drums with the help of any overhead load lifting arrangements such as chain blocks, chain hoist or EOT. 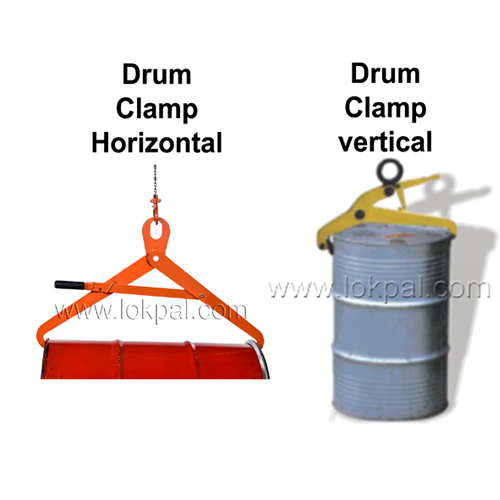 Two basic models are available - Drum Horizontal Clamps for lifting the drum when it is in horizontal position and Drum Vertical Clamps for lifting the drum when it is in vertical position. Specially designed self locking arms and flippers are provided to give the clamps extra reliability and safety. Designed to handle standard steel drum of 210 ltrs. Specially designed clamping attachments for handling MS drums with the help of Stackers or Fork lifts. 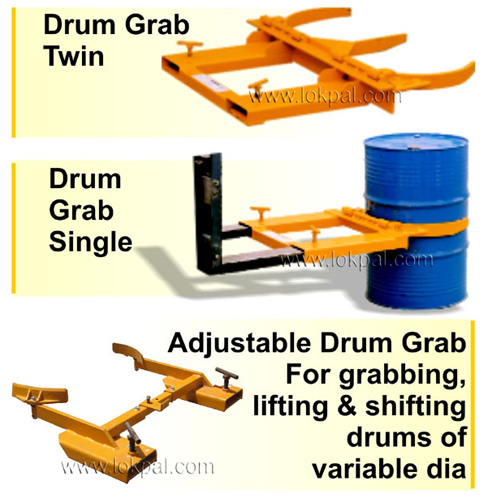 Two basic models are available of Drum Grabs. 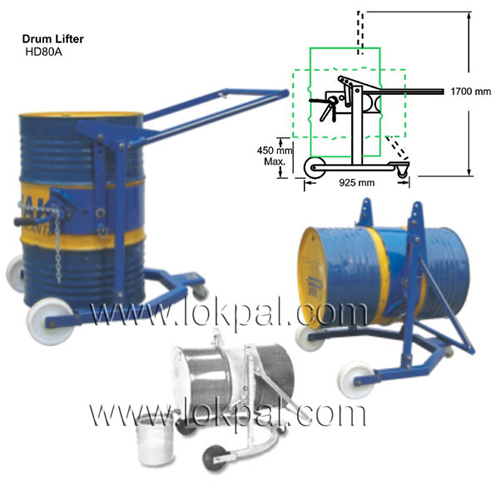 Single Drum Grab for handling single drum and Twin Drum Grab for handling two drums at a time. The attachment easily grips the drum and locks it in place as the forks lift and on lowering the drum on to the floor, the locks get released. Specially designed self locking grab arms provides excellent gripping. Designed to handle standard steel drum of 210 ltrs. 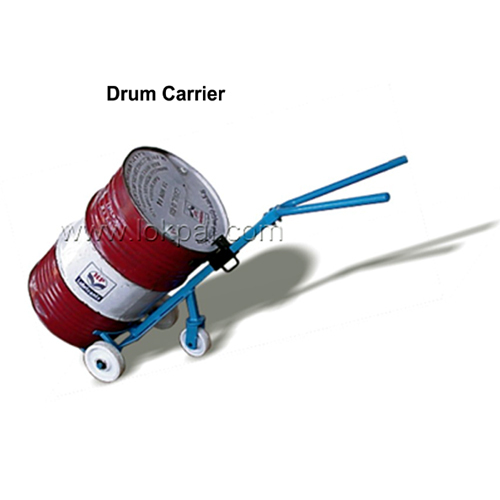 Drum Carrier / Cart & Cradle for moving/transporting drums from one place to other. Light weight and easily maneuverable. For moving/transporting drums from one place to other. Specially designed V-shaped handles for ease in holding and moving the equipments with the drum. Swivel wheels at back helps in giving direction and reduce effort of operator while moving the equipment with the drum. Specially designed tapered tips for easy insertion at the bottom of drum. Useful for handling std. MS/HDPE drum of 210 Ltrs.